I hope I'll find something to buy with the complete version (puzzle, mug, lithography). Or, they are showing it, but only if people put away phones and cameras...???? hmm??? If he didn't have enough time, then this leak probably is the unfinished version that will be unveiled at the celebration, but the online version could have more. It looks to me like there might be another face or creature between Finn and Rey's staff and there's R2 at the bottom. 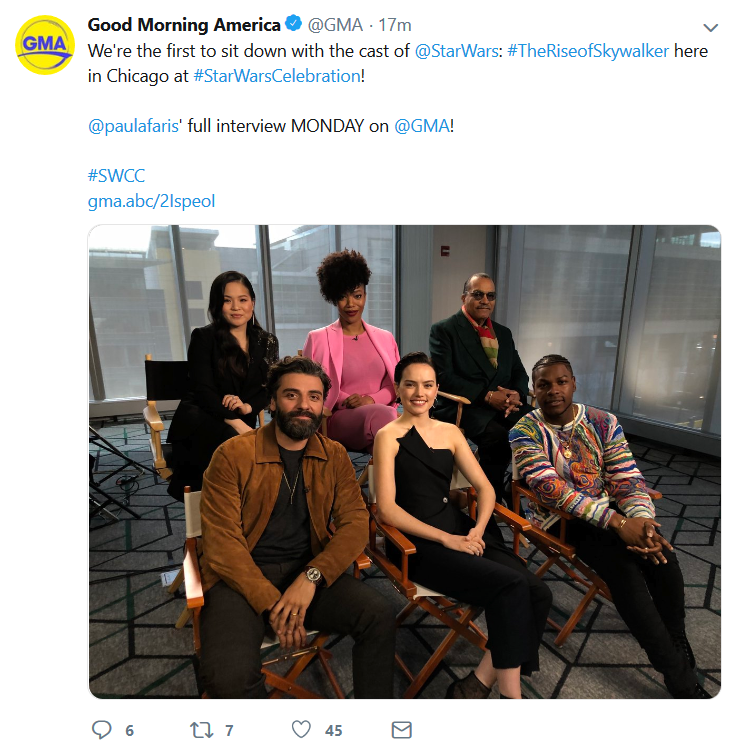 But it seems a bit strange that they went to the trouble to cover the last part up of the mural at SWCC to keep it secret, but then leak the image themselves at the booth. Did they leak a fake image to make the reveal tomorrow even more exciting, or were they just so excited themselves that they couldn't keep the secret for one more day? @fuhry wrote: @Forsythia The mended Skywalker lightsaber is there - it's hanging from her belt, but it's hard to tell because of Poe and Finn's blasters in the way. I see it now. I thought it was just a part of her outfit. Updates from social media. Disney just had some kind of investor day. They announced K-2SO will be in the Cassian show, The Mandalorian will be available upon the Disney+ launch, and most notably, all the SW films will be available on the service within the first year. Which leads to a whole host of questions. Theatrical or special editions? Which special editions? Or a new one? Remastered? Will they also come out on a new Disney-branded blu-ray release too? I remember Gareth Edwards saying LF was working on a 4K transfer, since only TLJ and Solo have 4K releases. I'm not sure how this new service affects Disney's home video release strategy. Rise of the Skywalker is Rian-approved! I hope this picks up some attention. Also I totally typed "IX" because after literally years, it's weird calling it an actual title. RotS? The same abbreviation as Ep. III? Intentional? @californiagirl wrote: Rise of the Skywalker is Rian-approved! I hope this picks up some attention. I think we'll have to keep calling it IX. @MaddieDove Haha, I can't even get the title right. It's just so much harder than like, a number! 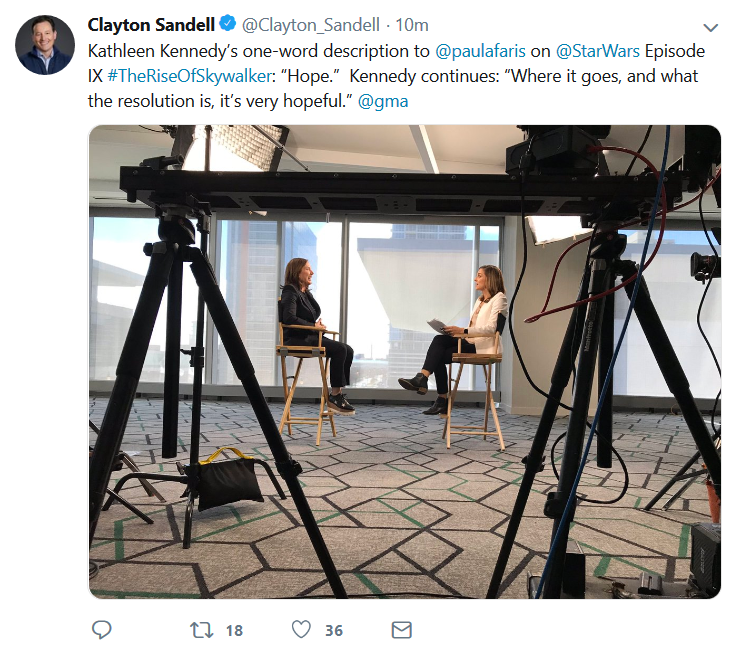 So... what we're saying here... is that Star Wars is about... hope? And that the trilogy will have a hopeful resolution that respects that major theme? After all this time? Ooo, there's a whole cast interview for Monday. As we all know, nothing says "Kylo's going to die a bad guy lol" like "Star Wars IX is about hope. Where it goes, and what the resolution is, it's very hopeful." @ZioRen wrote: As we all know, nothing says "Kylo's going to die a bad guy lol" like "Star Wars IX is about hope. Where it goes, and what the resolution is, it's very hopeful." ugh some people think he will turn good but he'll still die at the end -__- why are people sooo dense. Can people not read? How can rise if he dies right after?! Also Monday is too far away ugh. Yesss! Inverse Anakin doesn’t mind sand! They also mentioned in their podcast this gorgeous light side theme that someone made a year ago. It's stunning! Very much a "friend of a friend of my mom's best friend's college boyfriend said this" situation, haha. Unfortunately we've seen Reylos encouraging each other via false information before, but who knows. Bit weird and random that they would have a nickname for a trailer riff imo. Obviously would be very cool if true! Lolol I figured but it's many degrees but one can dream. It def sounded like redemption theme the second i heard it!!! Oh, it very much is! You don't very intentionally shift the villain theme's key from minor to major during the tile drop for nothing. Agreed. It does sound very much like a friend of a friend..." situation, and I doubt random trailer music gets named. Usually trailer soundtracks aren't even done by the film's composer, thus it's unlikely the trailer would introduce a new musical theme for the film. As far as I know, John Williams hasn't even started working on his episode IX soundtrack yet, so why would there already be a theme for future a reveal like Bendemption? I'm not even sure that it's supposed to be Kylo's theme at the end. Right before that, the trailer uses a variation of Leia's theme and the part that goes with the title reveal IMO sounds like a darker variation of a part from Leia's theme. The soundtrack is probably used for setting the mood for the trailer and not for thematic significance, anyway. @Cowgirlsamurai wrote: Yesss! Inverse Anakin doesn’t mind sand! 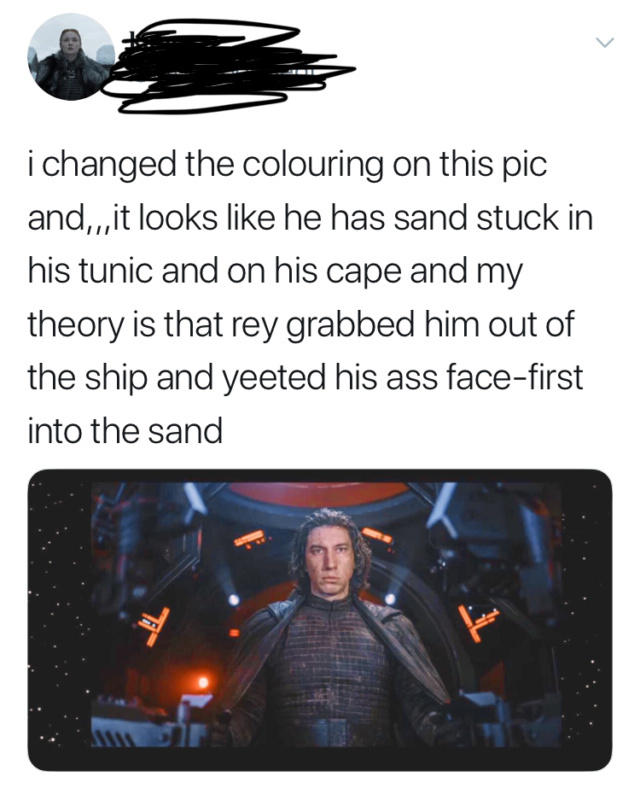 It DOES look like he got covered in sand! And somehow, I don't think they're going to be able to resist a sand joke. Also is it just me or does it look like Kylo's scar moved over slightly?